Phishing, as wikipedia puts it, is a criminal activity using social engineering techniques. I receive daily mails that seem to come from respected websites like ebay, amazon or financial sites that ask me to update my software by following a link from within the email. This leads to a fake website that looks similar to the website that you normally visit. Once you enter your login data the criminals will have and use that information for their own advantage. The developers of Firefox removed the option to disable third party cookies in firefox 2.0 stating the reason that it was not possible to block all third party cookies with this function. Third Party Cookies are mainly cookies that track user behavior, the big ad networks for instance like to use them a lot. There are basically two options to disable third party cookies in Firefox. I thought that it would be a nice idea to compile a list of privacy and security related add-ons for firefox 2.0. The list is not complete but I think I have everything covered with those add-ons, feel free to add your top picks in the comments. Let's go. IRC, Internet Relay Chat, is one of the greatest communication platforms on the internet. You normally connect to one of the IRC servers using tools like mirc for instance. Once connected you may want to start by receiving a list of open channels on that server and afterwards connecting to some of them. Once in a channel you can chat, privately chat and send / receive files to other users or channel bots. There are times when it is safer to remain anonymous on the internet - be it that you want to write something about your current company on the web, live in a country that does everything to prevent it's citizens from accessing unbiased information or simply for the reason that you do not wish that someone could track what you are doing on the internet. In an ideal world every user should have the right to read and publish on the internet without the fear of loosing his job or life. The world however is not ideal and tools like FoxTor exist to help those people out. This extension is sweet. If you like to open many tabs at once and flip around while surfing you might encounter the problem that you can't find a certain article in the massive amount of tabs that are open at the time. I usually flip through them until I find the article that I was searching for. Takes a lot of time and I always was hoping for an extension that would help me optimize this procedure. The Mozilla team finally uploaded version 2.0 final of Firefox to the ftp servers with the web servers surely to following not later than tomorrow. If you want to be one of the first to download the new final version I suggest you do so with the links for: Windows or Mac / Linux. While I was searching for a way to reduce the font size of my bookmarks toolbar I came across the extension UI Tweaker for Firefox. It felt strange that I've never heard about this extension before because it has some really nice features that change the appearance of firefox. 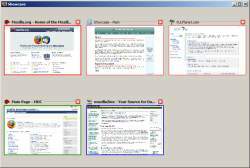 The extension offers five tabs (Menu hacks, Toolbar hacks, Tab hacks, Findbar hacks and Miscellaneous hacks). I have more bookmarks in that toolbar than Firefox was able to display which lead to the unfortunate situation that the last ones were not shown in this toolbar anymore. I was only able to access them using the arrow on the right side of that toolbar that contained all bookmarks who could not be displayed anymore. This was not a great situation and the first thing that came to my mind was to change the text of the bookmarks - identify the site with less text and you have more space for sites. The length of the bookmarks tab in firefox has been bothering me for a while. It is equal to the length of the largest entry which could mean that it could quickly clutter your interface when you have some sort of subfolder system that I use. One method to overcome this would be to strip every bookmark so that it would never use more than 20 chars, everything else would be cut off. I did that for some time but discovered a way that makes everything so much easier. Add N Edit Cookies is another must have firefox extension that makes it easy to add or edit cookies from within firefox. Cookies are bonded to a specific site which creates them on numerous occasions such as visiting the site, opting that your login data will be remembered or to track you while you are navigating the site. It is free to the publisher of the website which information are stored in the cookie that is created and it is lots of work to check on all cookies manually and figure out what they are doing. The title could be a bit misleading, GTDGmail is a firefox extension that adds additional functionality to your gmail account. Getting Things Done is a productivity concept that aids you in organising your tasks: "a person needs to move tasks out of their mind and get them recorded somewhere. That way, the mind is freed from the job of remembering everything that needs to be done, and can concentrate fully on actually performing those tasks"
We all witnessed AOLs bold move to offer a public download of 20 million searches that more than 500k of their users had conducted over a period of three months. The backslash from the internet community and the media was enourmous and as I expected AOL quickly fired three of its employees including CTO Maureen Govern. This does not help the 500k users whose searches are now public accessible. 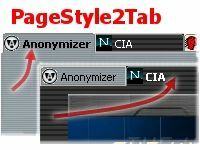 Page Style to Tab is a really useful Firefox extension that displays the tabs that are open in the style of the page. This is helpful because it is so much easier to distinguish the different tabs. You are able to configure this extension further by choosing if the colors of the current website should be displayed only in the tab or the complete browser. It is time for some new Firefox extensions and the first one that I would like to introduce is called Search With. The Firefox extension adds a Search With option to the right click menu. To use it you select a text, right click afterwards and select Search With which opens a submenu that allows you to select a search engine to search for the selected text. How much time do you spend surfing the internet using firefox daily ? What ? You can only guess the amount of time ? The Timetracker extension for firefox will help you track the time you used firefox. Maybe you get paid for surfing the web and you want to keep track of the time to know how much you will earn. Maybe you are just a curious lad who wants to know how much you are surfing a day / week / month or even year. Some Firefox extensions seem to cause problems when enabling them, like making firefox slower or even crash the browser. This is of course not intended behaviour but it still occurs rather frequently when new extensions are released. The problematic extensions web site lists known bugs and workaround for many firefox extensions.